Long, narrow and mountainous, New Ireland boasts undeniable beauty, peaceful people, never ending beaches, the popular Malagan show, the unique annual Shark Calling festival, game fishing and a history visited by explorers, missionaries, traders and Japanese armed forces. Discovered by Dutch explorers in 1516, it was 1877 when the first missionaries arrived. With the development of copra plantations it soon became one of Germanys most profitable colonies. During World War 2, New Ireland fell to the Japanese and many of the islands towns, infrastructure and industry was destroyed. New Ireland was also the setting for the saga of the Marquis de Ray who advertised Cape Breton as a thriving settlement, sold hundred of hectares of land to gullible settlers who were dumped with three weeks supplies, including a mill, note books and bricks, into a tangled jungle, with perpetual rainfall and unfriendly neighbours. Most died of starvation or malaria before being rescued and sent to Australia. Parts of the grinding stone for the never used grain mill can still be found in Kavieng. As for the Marquis de Ray, he ended his days in a lunatic asylum in France. 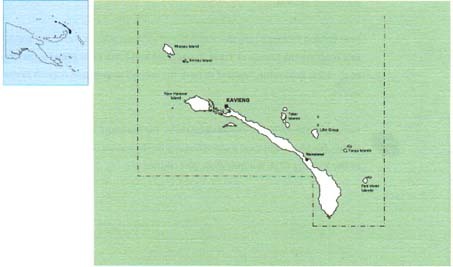 The provincial centre of Kavieng is situated at the northern tip of the island. It has often been described as a "typical Somerset Maughan south sea island port". It has a large, beautiful harbour and is a popular destination for game fishing enthusiasts. Along the edge of the harbour is Kaviengs Harbour Drive, a gently curve road, shaded by huge trees, which passes many points of historical interest. A couple of kilometres out of Kavieng, along the Buluminski Highway, a little pathway leads off the road to a limestone cave filled with crystal clear water. At Utu village, the high school has a small museum with exhibitions of Malagan carvings - carved totem-like poles used in initiation ceremonies and rituals; ancient stone tools and vessels and a shark catching propellor. New Ireland is the centre for the art of shark calling. Certain men have the ability to "call up" sharks. The unfortunate shark swims up to the callers boat where they can be speared and netted. Alternatively the shark propeller is used - a noose is hung with half coconut shells which make a rattling noise, attracting the shark up through the noose. A rope attached to the noose is connected to a wooden propeller which is spun round to tighten the noose and simultaneously pull in the rope. The shark, unable to keep moving, effectively drowns. New Ireland Province includes a number of offshore islands. 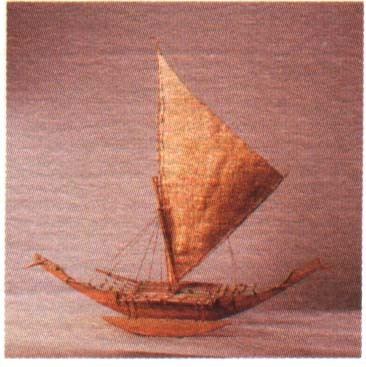 From the northeast coast are the islands of Tabar, Tanga, Feni and Lihir. Lihir Island is the site of the Lihir gold mine, reputed to have the second largest gold deposit in the world. Kavieng has three hotels, the Kavieng Hotel, the Kavieng Club and the Malagan Lodge. Freshly caught local seafood features on the menus of all hotels. Adjacent to the Kavieng Club is a nine-hole gold course. 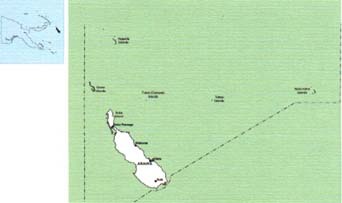 North Solomons Province has two main islands, Burka and Bougainville plus a scattering of smaller islands and atolls. It is located north east of mainland Papua New Guinea. A decade ago, North Solomon Province was the most frequently visited destination in Paua New Guinea. Its natural beauty and friendly people presented the perfect ingredients for an idyllic tropical island holiday. However during the last few years, internal conflicts have temporarily suspended services to the province and it is currently closed to tourism. Few people would expect to find fjords in Papua New Guinea. The Tufi area on the south east coast of Oro Province is one of PNGs best kept secrets. Situated on Cape Nelson, Tufi is a spectacular place to visit. Cape Nelson, jutting out into the Solomon Sea, was formed by the eruption of three volcanoes, whose fast flowing lava created the rias, or fjords. Unlike the fjords of Scandinavia, the water is always warm and the sheltered bays are home to stunning coral formations and tropical marine life. The fjords are over 90 metres deep and rise vertically out of the water to over 150 metres. Wide entrances are protected by reefs and they funnel into the mountainside where mangroves form a canopy over narrow waterways. The vertical faces of the gorge are covered with moss and orchids and waterfalls cascade directly into the sea. Wander among the villages or go to the open market and see the handcrafted pottery, jewellery and tapa cloth that are typical of the region. 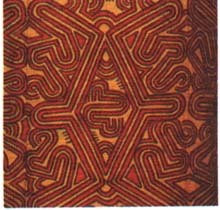 Tapa cloth is made from the beaten bark of the paper mulberry tree and decorated with exotic designs in natural earth colours. In October every year there is a Tapa Cloth Festival. Other festivals held locally are Martyrs Day and the Korata Church Day. The province is also the home of the largest butterfly in the world, the Queen Alexandra Birdwing, which as a wingspan of 30cm. With the diminishing rainforest, this species is unfortunately fast becoming extinct. There are a number of village guest houses which offer comfortable accommodation and will arrange fishing, diving and coral viewing excursions. The Tufi Dive Resort, perched on the side of a fjord has mountain views up and out to sea. It is constructed of bush materials and decorated with carvings and artefacts from around the country. 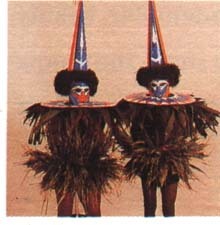 Oro Province has a history of drama, from the early gold rush days to the devastating Pacific campaign of World War 2. The northern end of the Kokoda Trail terminates at the village of Kokoda and from here to the coast, and around the beaches of Buna and Gona, some of the most violent and bitter fighting of World War 2 took place. It is estimated that over 15,000 Japanese soldiers died on the Kokoda Track. The area is still littered with war relics and at Jiropa Plantation on the Buna Road, there is a Japanese plaque commemorating their dead. Not long after the war Mt Lamington erupted, wiping out the district headquarters at Higaturu and killing nearly 3,000 people. 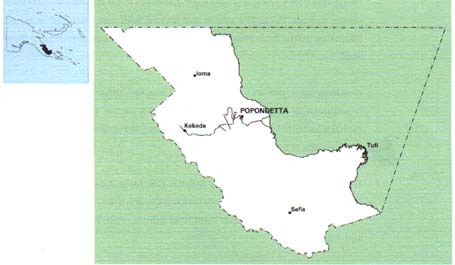 Today the provincial capital is located a safe distance from the volcano, at Popondetta. Mt Lamington is a favourite climb for bushwalkers. There are road links between Popondetta, Tufi, Ioma, Kira, Kokoda and Afore with PMV buses travelling regularly between the districts. 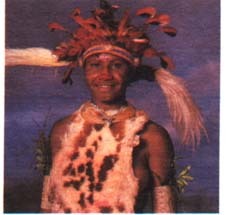 Oro Province is served by Air Niugini, MBA and other third level airlines, with flights to Popondetta and Tufi. Vanimo, the capital of Sandaun Province, sits on a neat little peninsula with beautiful beaches on either side. A pleasant walk around the headland brings the snorkelling enthusiast to several good spots. To the west, wade past vine draped limestone headlands to reach the final resting place of a rusted Japanese landing barge. Vanimo, 30 kilometres from the Indonesian border is PNGs entry port from Jayapura in Irian Jaya (formerly West Papua). This area of the world has seen little development in international tourism, other than visitors enroute from Irian Jaya to other parts of Papua New Guinea, or the intrepid traveller or surfer in search of the perfect wave. Superb beaches west of Vanimo, towards Wutung, attract surf board riders from PNG and overseas during the months of September to January. The 260 kilometre shoreline is pounded by heavy seas caused by the blustery north west winds during December to March. 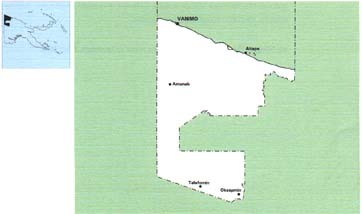 However safe all-year round anchorage can be had in Vanimo. Several little islands lie offshore from the town of Aitape, the only other town in Sandaun Province. Aitape was established as a station by the Germans in 1905 and was occupied by the Japanese during World War 2. Bits of aircraft wreckage can be found near the wartime Tadji airstrip and a war memorial stands nearby. The headwaters of the Sepik River are in Sandaun Province. Here the river narrows into dense, mountainous country and only small boats can navigate upstream from the village of Ambunti. There are no roads in the Upper Sepik and much of the province is covered in rainforest. The villages here are known for their specialist religious cults. The people of Maio and Yessan have a yam cult and the isolated villages of Swagup is the home of the insect people, whose art form incorporates the figures of the sago beetle, dragonfly, praying mantis and other insects. Among the distinctive artefacts from Sandaun are painted canoes of Sissano Lagoon and large shields from the Telefomin district. 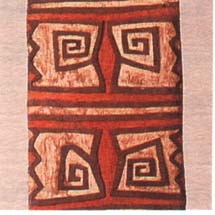 The shields have broad zigzag, spiral or V designs that represent their ancestors bodies. Vanimo has three hotels the largest of which is the Sandaun Motel. In other parts of the Province village accommodation is available and some mission stations also offer simple accommodation. Air Niugini flies to Vanimo weekly enroute to Jayapura, Irian Jaya. In the heart of the Highlands is Simbu Province, bordered by Madang to the north and the Gulf country to the south. 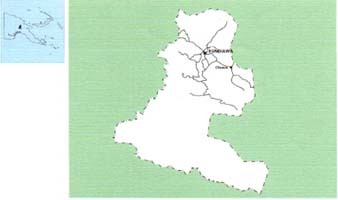 It is the smallest but most densely populated of all the provinces. The terrain is extremely rugged, with many of the valleys inaccessible. Some of the highest mountains in Papua New Guinea are in Simbu Province including Mt Wilhelm, at 4,509 metres, the highest peak in Papu New Guinea. Known to avid mountain climbers around the world, for the reasonably fit it is not a difficult climb for those who like to be physically challenged. There is a clearly marked track which passes traditional Simbu villages, through dense rainforest, into the valley before reaching Pindaunde Lakes where there are basic huts for overnight stays. The view from the summit is spectacular, on a clear day stretching from the north to the south coast. Cold weather gear is recommended as it can get very cold on top, sometimes snowing. Guides and porters can be arranged as well as organised trekking expeditions. A trout and rabbit farm at the base of the mountain has a guest house with easy walking tracks nearby. Kundiawa, the provincial headquarters is set in picturesque surrounding beside a spectacular airstrip built on a sloping ridge beneath the towering mountains. Kundiawa is not a tourist attraction in itself but a stepping stone for mountain and river adventures in other parts of Simbu Province. Only a few kilometres from Kundiawa, close to the main road, are the Keu Caves, suitable for caving expeditions. There are a number of other caves around the district which are burial places for the remains of warriors killed in battle. The Wahgi River is considered by experts to be one of the best rafting experiences in the world as the river rushes through deep chasms, stretches of rapids, under small rope bridges and waterfalls. Serious bushwalkers can follow a four-wheel drive track down to the coastal town of Madang. The three or four day walk offers the intrepid bushwalker some of the best look-out views in the country.